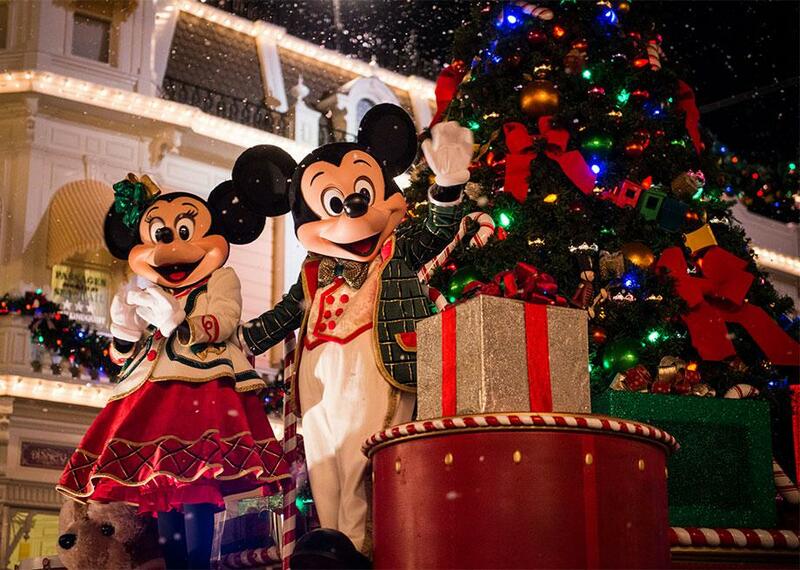 At Disney, we love, love, love celebrating the holidays at Walt Disney World® Resort . . . where the beauty and spirit of the holiday season is everywhere you look. This year, there are some exciting new holiday delights we want to tell you about so you can plan to experience them all. First of all, you’re invited to Mickey’s Very Merry Christmas Party at Magic Kingdom® Park. The separately ticketed holiday event is held on select nights from November 7 to December 22. Partygoers enjoy spectacular treats like a festive fireworks show; the colorful, fun-filled Mickey’s Once Upon a Christmastime Parade; free cocoa and Christmas cookies at special stations throughout the Park and this year — a brand new castle stage show — Mickey’s Most Merriest Celebration. We asked Denise Case, Show Director, Walt Disney Parks & Resorts Creative Entertainment to tell us about it. “The show is about Mickey and Minnie hosting a holiday celebration for their friends,” Case says. “After all, they’re known for giving the best parties in the world!” According to Case, whose excitement is contagious, the upbeat, high-energy show includes 26 Disney & Pixar Characters, innovative new light projections on the castle, and a grand finale that will send holiday shivers of joy down your spine and warm your heart. Then it’s over to Disney’s Hollywood Studios® for a brand-new fireworks and light projection show, “Jingle Bell, Jingle BAM!” at Center Stage. It seems Santa has gone missing and Guests go on a fun-filled mission through an amazing variety of Disney Christmas film classics to search for him while light projections transform the Chinese Theater into everything from the North Pole to Halloweentown from Tim Burton’s The Nightmare Before Christmas. With a lively new musical score, fireworks, rooftop pyro and snow, “Jingle Bell, Jingle BAM!” hits a very merry high note! Be sure to see it November 14 through December 31. If you love holiday lights, food, music and shopping for presents for those special people on your Christmas list, you’ll find it all at Disney Springs™, which is celebrating its very first holiday season. From unique custom holiday decorations, to over 20 live musical acts performing nightly, and visits with Santa in his chalet in the Marketplace, you can find plenty to put your entire family in a holiday mood. Fill your stockings with presents found at over 100 great shops you can explore, including UNIQLO, Basin®, Vera Bradley, Chapel Hats, Anthropologie, World of Disney® store and more. While you shop, enjoy a delicious sweet treat from The Ganachery, Disney’s own sophisticated chocolate boutique, or a holiday cupcake from Sprinkles. 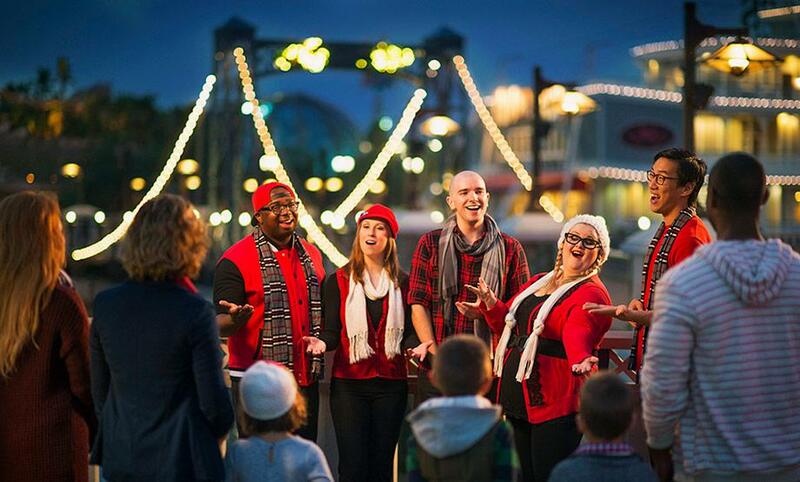 Disney Springs™ is a place where you can gather together to celebrate the beauty of the season as you remember childhood holiday memories and create many new ones, as well. Don’t miss any of the holiday fun at Disney Springs™ and come celebrate the holidays November 11, 2016 through January 8, 2017. Don’t know about you, but we’re already packing our sleigh and getting ready to go. And here’s a hint to Disney Visa Cardmembers: bring an empty stocking or two to fill with holiday goodies to take home and take advantage of 10% off select merchandise purchases of $50 or more at select locations at Walt Disney World® Resort.2,3 For more information about happy holiday happenings, visit DisneyWorld.com/Holidays.